I belong to the city of Allahabad. I have done my B. Tech in Mechanical Engineering from Motilal Nehru National Institute of Technology, Allahabad. I am a person who likes to enjoy and be happy. I like playing cricket a lot and I am a happy go lucky person. My father is an Advocate in Allahabad high Court, Mother is a house wife. Bhaiya and Bhabhi are both engineers working in JSPL Raigarh, Chattisgarh. The new entry in our family is my wife Prachi Ailawadhi Mishra. She is an Indian Forest Service Officer (presently under training) and in CSE 2016 she has secured an AIR of 290 and will probably get IRS (IT). After college, I joined Indian Oil Corporation in Mundra, Gujarat and after a year of service i.e. in 2012 I made up my mind to take a shot at this exam. 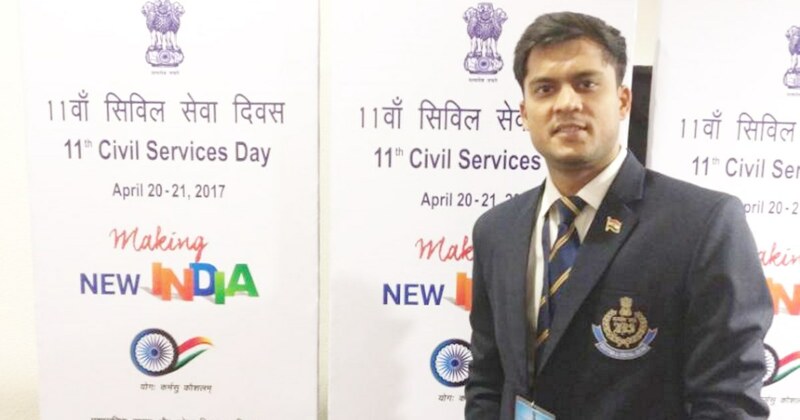 I entered in this field of competitive examination because of the atmosphere and aura regarding IAS that I witnessed in Allahabad, which was once regarded as hub of civil services examination, and nudge from my family and friends. Both electronic and paper material have their own relevance. Reading books and newspapers in my opinion are irreplaceable aspect of this examination. They provide a good foundation for preparation for this examination. Availability of electronic material on the other hand helps adding value to the basics already prepared. Regular write ups on a range of topics are available and they have quality content, the approach should be to take out the relevant information from these sources and add it to your notes. For example, say a particular site has an article on black money. One can read this article and use data, examples, etc. ; from this to add to your basic notes on topic of black money. In addition to it, some online sources cover many topics of the syllabus in a qualitative manner which is not covered by any book. For example Location factors (of GS-1) and Land Reforms (GS-3) are brilliantly covered by this site (mrunal.org). In this way online material can also prove to very helpful in covering the syllabus. However online sources should be seen as a double edged sword as it can also lead to wastage of time and duplication of efforts. With coming of these online sources civil services examination is suffering from problem of plenty. The attempt should be selective and judicious reading of the sites depending upon their content and limit your online sources (say 2-3) for a particular topic. There is no point in reading the same topic from 4-5 different sources. Daily hrs spent on whatsapp and telegram study groups I was part of a whatsapp group where we shared good newspaper articles (as different people read different newspaper) and some other exam related information. There was no strict division of time between online and offline preparation. They were concurrent, for example if I read an article in the newspaper and it was not clear, I will search the material online and try to read it and prepare concise note for the topic at that time only. For some topics I didn’t make notes but I realize that it was not the wise thing to do. Notes making is a critical part of this examination as we read a lot and if we don’t maintain notes it will be difficult to revise and use our reading in examination as we may struggle to remember it. My friend Abhishek Pandey told me his style of notes making which I tried to implement. He wrote basics of a number of topics given in the syllabus and then left few pages blank after it. He continuously updated this on the basis of newspaper articles and online sources. With this sort of notes making one can get holistic information and coverage of a topic over a period of time at one place. It helps in relating the basics of a topic with the current affairs and also in remembering the current affairs. Economy (theory + current) Mrunal.org and Sri Ram coaching notes. Science (theory + current) NCERT 9th and 10th book. Schemes, Policy & Filler Stuff Some coaching compilation which I got hold off. After going through the paper I also felt that it was difficult compared to 2015 and 2016 papers. Hence I believe that cut off will also be on the lower side. 90+ strategy can’t be applied in every type of paper. While it may be a good approach for earlier year papers as cut off would be more in easy papers this time it should have been moderated. Guess work is required in prelims examination but it should not be blind guessing. Intelligent guessing based on elimination technique should be used to make out answers when direct answer is not known. I will continue with my approach of focusing on the basics and reading the syllabus (static part) atleast twice before the examination. In addition to it going through the current affairs and practicing a lot of test series papers. Special attention needs to be paid to environment and art & culture portion as good number of questions are asked from this area. Practice is the key. If one is having issue in this he/she should practice a lot of test papers and increase his/her efficiency in this paper. Yes I collected test papers from a lot of different sources and solved them. I don’t know whether they are necessary or not but certainly they are helpful. The difficulty level of the compulsory language papers depends upon one’s background. For example many rural background or Hindi medium students may find difficulty in dealing with the English Language paper. Hence one should realize his/her own comfort level in these papers and put in work as required. The important point is that it should not be taken casually. One can refer to previous year papers and analyze the areas in which efforts are required. Some practice of writing before examination can also help in dealing with these papers. I have always struggled with the essay paper, so my approach should be read with caution. Collection of good anecdotes, quotes and lines from different sources and reading essays of people who have scored marks on a consistent basis & speeches of people like President, CEO, etc. ; gave good fodder points for essay and also provided insights as to how a good essay can be written. Then practice by writing a lot of essays on a weekly basis and getting it reviewed by peers and teachers helped to find flaws in my approach and writing style. Aim was to refine my essay writing skills by overcoming these flaws and gain confidence in essay paper. Introduction and Conclusion parts of essays are very critical and I tried to prepare some good introduction and good conclusion that can be used in the paper by adjusting it to the demands of the topic in the paper. Section A: Innovation is the key determinant of economic growth and social welfare. Section B: Cyberspace and Internet: Blessing or Curse to the Human Civilization in the long run. I don’t exactly remember now, what all I wrote in the essay paper. Alok Jha Sir’s class notes and for some topics CCRT website. world history NCERT + Mastering Modern World History by Norman Lowe + Alok Jha Sir’s Notes + Some Mrunal Videos on World History topics. post-independence India Bipin Chandra’s India after Independence (only some topics are relevant to the syllabus) + NCERT+ Compiled some topics from Mrunal (like Land Reforms) and GK today website. Indian society Basics from NCERT+ Mostly Current Affairs from News Paper+ Government Reports and Committee/ Commission recommendations on society topics+ Facts related to the topics in the Syllabus. world geo physical NCERT+ Goh Cheng Leong + Some topics from Savinder Singh+ Guidance by Tirthankar Sir (of Lukmaan IAS) on how to write answers in geography section. impact on flora-fauna Current Affairs and some Site searching. As I had Public Administration as my optional therefore I did not prepare many topics from GS-2 separately but clubbed them with my Public Administration paper 2 preparation. In this paper I compiled some HC and SC judgements and tried to use them wherever possible along with use of Articles from the Constitution pertaining to the questions asked in the paper. A good source of this paper is PRS website (www.prsindia.org). Analysis of bills and acts and collection of data regarding working of parliament and committees of Parliament can be used in answer writing. In addition to it, recommendations of these Committees can be quoted while presenting your answers. Indian Constitution, devolution, dispute redressal etc. Lukmaan IAS (Salamuddin Ansari Sir) class notes + Current Affairs related to it was added on a day today basis. comparing Constitution with world Lukmaan IAS (Salamuddin Ansari Sir) class notes + Current Affairs related to it was added on a day today basis. parliament, state Legislatures Lukmaan IAS (Salamuddin Ansari Sir) class notes + Current Affairs related to it was added on a day today basis. executive-judiciary Lukmaan IAS (Salamuddin Ansari Sir) class notes + Current Affairs related to it was added on a day today basis. ministries departments Lukmaan IAS (Salamuddin Ansari Sir) class notes + Current Affairs related to it was added on a day today basis. pressure group, informal asso. Lukmaan IAS (Salamuddin Ansari Sir) class notes + Current Affairs related to it was added on a day today basis. Representation of people’s act Lukmaan IAS (Salamuddin Ansari Sir) class notes + Current Affairs related to it was added on a day today basis. various bodies: Constitutional, statutory.. Lukmaan IAS (Salamuddin Ansari Sir) class notes + Current Affairs related to it was added on a day today basis. NGO, SHG etc Lukmaan IAS (Salamuddin Ansari Sir) class notes + Current Affairs related to it was added on a day today basis. welfare schemes, bodies Lukmaan IAS (Salamuddin Ansari Sir) class notes + Current Affairs related to it was added on a day today basis. social sector, health, edu, HRD Lukmaan IAS (Salamuddin Ansari Sir) class notes + Current Affairs related to it was added on a day today basis. governance, transparency, accountability Lukmaan IAS (Salamuddin Ansari Sir) class notes + Current Affairs related to it was added on a day today basis. e-governance Lukmaan IAS (Salamuddin Ansari Sir) class notes + Current Affairs related to it was added on a day today basis. role of civil service Lukmaan IAS (Salamuddin Ansari Sir) class notes + Current Affairs related to it was added on a day today basis. Challenge and Strategy: Rethinking India’s Foreign Policy. This book helped me to think over foreign policy issues in a better manner. bilateral/global grouping Current Affairs + Vajiram IAS compilation + IDSA website. effect of foreign country policies on Indian interest Current Affairs + Vajiram IAS compilation + IDSA website. Diaspora Current Affairs + Vajiram IAS compilation + IDSA website. international bodies- structure mandate Current Affairs + Vajiram IAS compilation + IDSA website. In this paper for value addition topic wise collection of the recommendations of Committee/Commission and facts can help. For example while writing answers if one can refer to a committee recommendation and use a relevant fact it will give an edge to the answer. Indian economy, resource mobilization No specific source. Only Current Affairs or any other good article related to it. Budgeting My Public Administration Notes had this topic, so basics from that. Current Affairs and collection of facts from the Budget (for e.g. Gender Budgeting fact became useful for CSE 2016 GS3 paper). Disaster Management NCERT + Current Affairs like (Urban Floods and NDMA guidelines on it). NDMA website can help in preparation for this topic. non state actors, internal security Challenges to Internal Security of India. This is a book written by Ashok Kumar (IPS) and Vipul Kumar (DANIPS). This can be really useful for basics of all the security topics. Current affairs and government policies and approach. Government sometimes forms Committees for looking into the security issues. Report of theses are also good source for preparing these topics. For example Gulshan Rai Committee on Cyber space security last year. internal security – role of media, social networking site Same as above. cyber security Same as above. money laundering Same as above. border Management Same as above. organized crime, terrorism Same as above. security agencies- structure mandate Same as above. For this paper I relied hugely on LUKMAAN IAS notes and Ansari Sir’s Personal guidance. In addition to it we (me and my group) collected a lot of examples and case studies for the different topics which can be used in the exam. Bringing diverse sources like sayings from holy books like Gita and Ramayana, Stories from Panchatantra and quoting current affairs or historical examples can also be helpful. But whatever one is using should be context specific. moral thinkers of India and world 10-15 popular thinker like Gandhi, Buddha, Vivekananda, Plato, Aristotle, etc. I don’t agree that they most of the candidates have received marks in similar ranges. Many serious candidates have not secured good marks. On the contrary I think this paper is scoring and creates a good difference in the total marks. About the random definition part, it happens only with one or two questions rather than worrying over it we should aim to score marks in the known questions and answer the unknown questions using common sense and general examples. Covering the basics for the given topic in the syllabus and then collecting good examples for them in my opinion is a good approach for this paper. In addition to it work should be done on the presentation of case studies to improve marks in this section. In my opinion all the questions must be attempted. This is so because every mark counts and a change of 5-10 marks can push you out of the list or into the good ranks. However time should be used judiciously. Maximum time should be given to known questions and effort should be made to score well in these. Like on an average, if one is getting 8-9 minutes for every question, unknown questions can be answered in say 4-5 minutes and time saved can be used for answering the better known questions. In the remaining questions whatever one knows can be written but again one should not write what is completely irrelevant and wrong. For example if you know a part of a question then that can be written and unknown part can be left. To give an illustration, in the McBride Commission question in GS2 last year some people wrote about UNESCO and few general lines on McBride Commission. I enjoyed writing in fixed space answer sheet because once you know that space is limited you will not waste your space. I took some time to think and prioritize what is to be written. If handled well it can help increase the quality of the answers and also adequate time can be given to every question. Whether the answer is to be written in bullet points or in paragraphs depends upon the demand of the question. A question can be written using mix of point and paragraph format also. I wrote most of the questions in this format. Analytical questions in which views are to be articulated can be more effectively answered in paragraph format and questions in which content is to be enumerated can be answered using point/bullet format. Keywords like enumerate, justify, comment, examine, etc. have their own relevance and answers should be written accordingly. For example if keyword is justify or illustrate then giving example or presenting some case study is a must and if question says comment/examine a stand needs to be taken. I tried to use this introduction-body-conclusion in almost all the questions as it gives a proper structure to the answers and person who is reading answers in this format gets a sense of closure after going through the answers. It also captures the answers in a holistic manner. Introduction can be general 2-3 line over the topic or by relating it to any current affair (say recently “this this” happened and hence “topic” has gained importance). Body is the main content and needs to be given maximum attention. Lastly conclusion gives a closure to the answer and way forward or any suggestion can be used to end the answer on a positive note. Q6. Did you draw any diagram in any paper? (e.g. in GS1 Geography) Yes wherever possible I drew diagrams. optional because not even 20 are getting interview calls and so forth (data unverified). So, kindly provide wisdom for younger aspirants. I agree to the fact that the optional subject has made a lot of difference this year and this is perhaps true for every year in general. But it is not just the optional, essay and ethics paper are also equally important papers that create a lot of difference in the marks of candidates and decide the ranks apart from the interview. Many people have got ranks inspite getting average marks in their optional by performing well in essay and ethics. My optional subject was Public Administration. I took it because of the availability of good guidance and my personal liking of the subject. It totally depends on the individual. I will suggest go through the syllabus, some material and some previous year papers and take your call. Other important committee and commission recommendation like Malimath Committee, Kiran Agrawal Committee, Punchii Commission, etc. Some online sources for collecting good content for topics from Paper 2 and some topics in Paper 1. For example say PERT, CPM, Secretariat like topics. No book from above list needs to be read from cover to cover. Selective reading would be better. I read from Ansari Sir’s notes and then to add value to it and to improve my understanding referred above books. Some chapters in the above mentioned books are really important and UPSC questions have many a times have come directly from them. In Paper 1 understanding of Chapter 1, 2, 3, 4, 5, 7 and 8 can be improved by reading Mohit Bhattacharya New Horizons of Public Administration and his other books. In addition to it, cross linking of different topics in the syllabus and collecting context specific examples from newspaper and online sources can enrich content for this paper. In paper 2 effort should be to read the basics of all the topics of the syllabus. I did it from above sources. In addition to it compilation of facts for different topics (PRS is one of the good source) and committee/ Commission recommendations from different fields can be done. Also collecting some good examples and case studies from newspaper and Yojana can help improve the quality of answer in this paper. Some online research is needed for preparing this optional apart from basic books and notes especially for collecting examples, recommendations, etc. and for covering some topics which are not otherwise covered properly. Also organization like UNDP, WB, etc. publish some paper which are quite useful in updating some topics is Paper 1. It should not be overdone as it would lead to wastage of time without adding any value to your preparation. I had self-notes in paper format that I used for revision before the examination. 2016 public administration paper was an easy paper compared to earlier papers (after 2011 public administration has seen a churning and hence it can be said last year paper was perhaps the easiest since 2012 paper). In previous year papers a lot of random questions were being asked, even understanding them was a challenge leave aside answering them. Then a lot of questions came from outside of the syllabus or so called “hidden syllabus”. Atleast in this year paper questions were from known topics and one could answer them. One precaution is that sometimes we flow with the trend, which is also right, but we should remember that UPSC breaks its own trends and hence we should be ready for it. We should always focus on the basics and practice writing both the easy and difficult questions to keep prepare ourselves for any eventuality. Prepared notes for my DAF and work experience related information. Read newspaper and updated myself with the current affairs especially budget, economic survey and other major policy issues. Gave some mock interviews to gain confidence and for practice. I also had discussion with my friends and batchmates over various current issues and some basic questions that are expected in the interview. I took 4 mock interviews this time. They are good for practice and for gaining some confidence but they are very different from the official interview simply because the environment. In official interview pressure and anxiety are high which not the case with mock interviews. Even easy and straight forward questions look tough under pressure. The aim is to practice giving answers under such environment. Many people don’t appear for mock and yet score good marks so it’s up to the individual to decide whether to appear for mock or not as per his/her comfort level. In my training academy NACEN at Faridabad, Haryana. I revised from my DAF related notes and some current affair topics that I had prepared. A formal suit of grey color and a white shirt. No, this question was not asked to me. I would have said that: I want to join civil service because it a very satisfying career option. Not only it is one of the best professional career option but the work itself gives a feeling of happiness. One can see his/her contribution in the development of the country much more directly, which is unique compared to other career option. Also the career profile is very diverse and challenging that keeps alive the enthusiasm of the individual in the job.Also civil servants get a lot of respect and social recognition which is an added motivation to join civil service. So you have mastered the art of clearing this examination. What is your secret? Analyze the merger of railway budget with positives and negatives for us. Do you think there is need for capital infusion in railways? Money doesn’t come for free how will we pay or return the money (in continuation of the above question when I said that there is a need of capital infusion in Railways). What can you do to promote the freight component in railways? Do you believe a country has right to restrict immigration? What is USA’s action on this recently? Is it a right decision? Why is India bothered about the H1B visas? What is Gender? What are issues associated with it? Should farm loans be waived? What were your favorite subjects in Mechanical Engineering? Why public administration over Mechanical Engineering as an optional? What do you do in Cricket? What is a Chinaman bowling? In Indian team is there a Chinaman. Who amongst the batsman that got out yesterday was dismissed out of his own mistake? What can you do to speed up the railway project implementation and solve out the problems of environmental clearances? What are the challenges of taking Railways to North East and hilly regions? Member 3 cont. : What technology has China used to bring railways to Tibet? Is there a rational in taking railways to these areas? What is levitation? What are its advantages? Analyze the intention, components and strategy of the food security act. Chairman: What are some of the features of the Food Security act? Do they get it for free? How it is to be done? Member 4 cont. : Do you see any other motivation behind Jallikatu ban? Is there any parallel of it in the world? What is it called? It was a very comfortable interview with questions from my DAF and current affairs. It happened in a very cordial environment and they asked mostly view based questions. No it was not a stress interview and they didn’t ask uncomfortable questions. However if such questions are asked and environment of stress is created, best way is to remain calm and composed and talk logically over the issue or try to tide over the question by saying “I’m unable to recall If it’s a factual question” or “ I believe in this” etc. Body language in such cases becomes very important and holds the key. It should not look that you are under stress even if you are under stress from inside. Try to collect all the documents that are required one day in advance prior to the interview to avoid any added anxiety on the interview day. Before coming into civil services, I was working in Indian Oil Corporation Limited. It is a very good organization (a Maharatna PSU) and I would have continued with that job. Not applicable in my case as I was already in the job. I believe that optional subjects should be removed and all candidates should appear with common papers. This will provide a level playing field for all. In addition to it, yearly trend of different optional subjects that makes or mar selection would end. It will make this subjective examination a little more objective. In my point of view setting cut off from a single paper is risky for candidates. Therefore it would have been better if CSAT paper score were added for cutoff calculation. Moreover the rationale for doing so is that it has component of mathematics and non-science background candidates are at a disadvantageous position vis-à-vis science background students. If that argument is to be taken further, science students can also say that arts and humanities subject dominate mains examination and hence they are at a loss. So basically there is no end to this debate and hence it should not become a criteria for reform in the examination pattern. This is a generalist examination and hence one should basics of a lot number of things. The level of mathematics asked is very basic and one can learn that with some practice and hardwork. However the translation of the paper should be done in a proper manner so that language does not become an impediment in answering comprehension and other logic based questions. Yes that can be done to improve the process of the examination. The official answer key will end the anxiety among the candidates with regard to the total they are getting and cutoff will make things clear for them. However as a fall out it, may lead to increase in litigations against UPSC as there are always some questions which are in grey zone and if some candidates are getting disqualified because of them they may approach the court and seek clarification. It will put the entire process in danger and probably delay the entire examination. Since this examination has subjective paper components, I don’t think it can be conducted completely online. The prelims part can be conducted online and it will speed up the process and help in shortening the duration of the examination. I think it would be better if IFoS and CSE examination are conducted separately. Removing the optional subject and making the examination process more objective will be on the top of my agenda. I will say that in this examination “profile” does not matter at least till the mains examination. What will determine your success is the hardwork and the strategy for this examination. The results of CSE of any year would make this clear. Be confident of who you are and what your background is and hope to improve in future. In the interview process this confidence will make things a lot easier for you. I will say have a hobby and some other distraction. Whenever you feel low and frustrated pursue these and also enjoy while you prepare. This will make yourself strong and provide inner motivation to prepare for this examination. Q1. What went wrong in your previous attempt? What changes did you make in this current attempt? I think I was not answering questions very directly and according to the demand of the question. Hence I worked more on answer writing and practiced by writing a lot of test papers. I also enriched my content for GS and and revised some topics of the syllabus again which I thought I had not covered properly and also maintained notes for them. Rest I did the same as in earlier attempts. Managed my leaves and consistently prepared for this examination with whatever time I got. Main thing is to have a strong dedication for this examination which will prevent you from being complacent and help you maintain the initial enthusiasm. Don’t be in isolation, talk to your friend and family members or other support system that you may have to lift up your spirits. Recognize what mistakes you committed in the last attempt and try to improve upon them. What has happened is past, don’t overthink it and prepare yourself for the coming examination. My parents, Bhaiya, Bhabhi and my wife have always supported me. All these people constantly encouraged me which helped maintain self-confidence and fight against depression and negativity. My mother’s word of encouragement were more than anything I needed for motivation. My wife and me prepared together this year and got through. She has an excellent presentation skills which she told me and it really helped me present my answers well. In addition to it I think she has brought the needed luck factor for me this time. My teacher Salamuddin Ansari Sir’s guidance was invaluable and his personality will have a long lasting effect on me. My friends especially Avnindra Kumar Rai whom I consider a copartner in my success and Alok Tiwari also played important role in my selection. I used Mrunal.org extensively for many topics. My source for entire economy portion, economic survey, budget and related current affairs used to be this site. The credit for simplification of economics and making it easier for aspirant goes to Mrunal Sir. As said earlier contents like land reforms. Location factors, etc. have been covered very well by this site. I make a point to visit the site regularly and see what content is available and go through it. 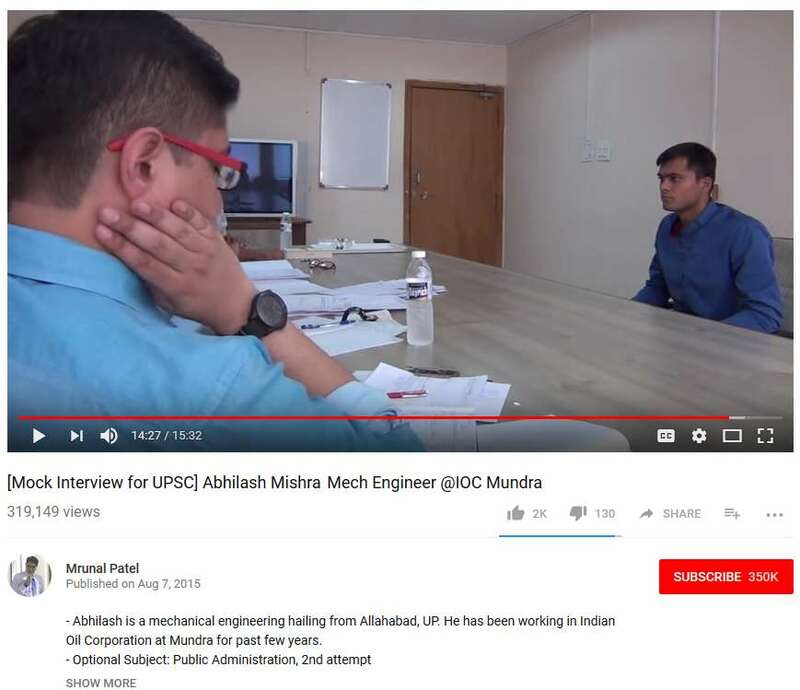 I was waiting for his interview since very long. Thank you, Mrunal sir. And many many congratulations to Abhilash Bhai. Mrunal sir, its request to you to start the job opportunity column again, as it was comprehensive and prevent our time from wandering here and there on other websites. You were providing all the relevant exams according to the streams at one place. Its a question of carrier of lakhs of aspirant, your initiative will be very useful. Which is best and easy subject of graduation which can also help in IAS exam preparation?